The design of M.E.T.A. aims to capture the essence of archaeology, namely the pursuit of uncovering and reinstat­ing the past via the literal excavation of the present. M.E.T.A., a vessel of archeological artefacts, is lifted off the earth, while at the same time uncovering the remnants of an ancient city bellow. This gestures to the conceptual “revelation” of hidden time layers that complements any architectural “excavation”. The landscape is formatted into a fragmented grid structure that symbolizes historical traces from all ancient civilizations that ever dwelled in Cyprus. The artefacts aim to reconnect the present and future with the past, reanimating the cyclical flow of history. There­fore, the historical exhibits are exhibited in a circular exhibition, where visitors would enter and exit via the same physical and temporal present point. Visitors will begin their tour at the oldest archeological era and follow the flow of history to the most recent exhibits. The exhibition space itself is subtle and neutral, where the real protagonists are the exhibits. Finally, the museum exit is through the gift-shop. 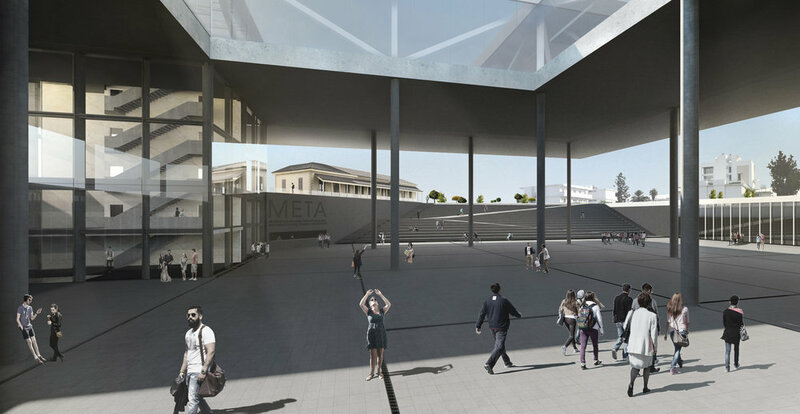 Access to the “lifted slab” where the exhibition is located is possible via two structural cores that connect it with the submerged (-8.00) plaza. The two cores are functionally distinct, with the northern one (adjacent to the preserved building) being allocated for the visitors. This is divided in two, serving both as an entrance and an exit to the mu­seum. The southern core is exclusive to the museum staff and connects all levels with staircases and large service lifts. Connectivity with the existing points of interest and infrastructure, especially with the old archaeological muse­um and the public park was very important. Two large underground garages are designed with access to Chelonos highway. Also on the Southern side, an over-ground “kiss & ride” parking is included with 70 parking spots that can accommodate large coaches. 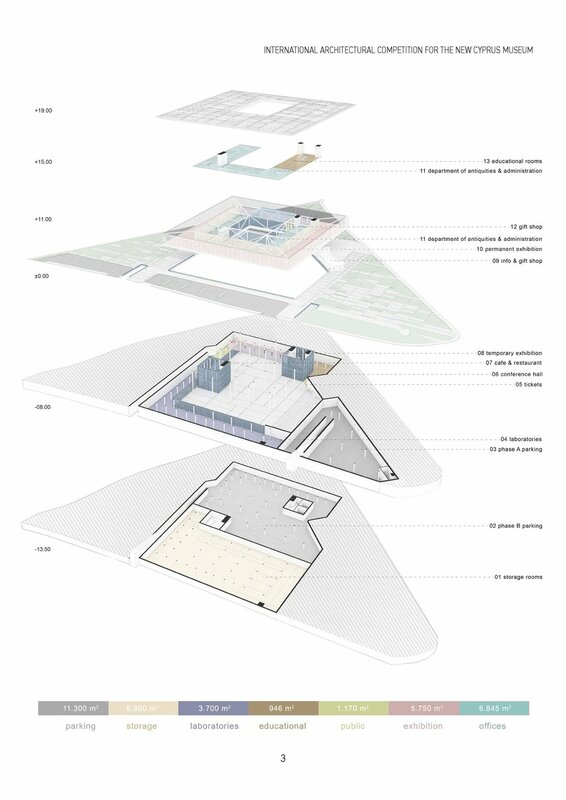 The museum as a whole consist of a reinforced steel structure and a variety of stone claddings. For the flooring, façade and ceiling a limestone clad is used, while the submerged plaza and the museum’s underbelly are covered in granite tiles. The use of stone as the primary material is a reference to archaeological excavations. Its color, rem­iniscent of the color of soil is prominent at an archaeological dig. Hence, the lifted slab, a part of earth detached and lifted, should consist of the same material and pattern with the main (Eastern) square. To provide a natural contrast, the area underneath the museum is of the same texture but of a darker shade. The landscape design utilizes elements integral to local life since antiquity. These include a mix of domestic Medi­terranean species of major importance to agriculture, cultural landscaping and economy. Such are olive trees, citrus trees, mulberry trees, bushes and herbs that manifest this concept and bring a unique sense of place and identity.